TomTom ONE IQ Routes is pre-installed with mapping for UK and Ireland. TomTom ONE IQ Routes provides 3.5-inch touch screen, with 2D or 3D moving maps display. TomTom ONE with IQ Routes technology - calculates your routes based on the real average speeds measured on roads. Always providing you with the fastest route, and most accurate travel timel. Additional TomTom ONE IQ Routes features include advanced lane guidance, TomTom MapShare technology and Help me! menu - providing local emergency service information at your fingertips. TomTom ONE IQ Routes has been discontinued. Accessories, spares and parts are still available for your ONE IQ Routes. TomTom ONE IQ Routes satellite navigator comes complete with mapping for UK and Ireland. The high-quality 3.5-inch touchscreen and latest version of TomTom's award-winning, user-friendly software enables you to plan your route to fit your requirements, such as: quickest, shortest, avoiding toll roads and congestion charge areas, by required arrival time, etc. Gives you extra clarity when navigating difficult junctions. ‣Includes 3 months trial of Safety Alerts and Fuel Prices bundle, for free. TomTom ONE IQ Routes has been designed to be a portable plug and play device, and as such can be transferred from vehicle to vehicle with ease by the user. TomTom ONE IQ Routes is powered with a 12-volt Compact Car Charger (supplied) and attaches to your vehicles windscreen via the TomTom ONE IQ Routes EasyPort Mount which is also included. TomTom ONE IQ Routes device comes with the latest and most complete maps of UK and Ireland. Door-to-door accurate navigation anywhere across the continent. Which in addition to street information include features such as route calculation, Points of Interest, Estimated Time of Arrival, and TomTom Map Share technology. TomTom’s unique Map Share technology enhances your navigation experience, because you can now make instant changes directly on your map. TomTom Map Share technology allows you to make corrections to your own map and benefit from thousands of corrections made by TomTom users every day - free of charge. Looking for genuine accessories and spares for the TomTom ONE IQ Routes? 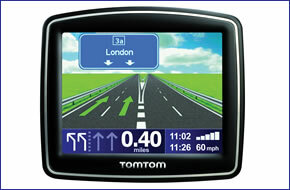 All parts are genuine TomTom product and specifically designed for use with the ONE IQ Routes sat nav. Accessories available to purchase include compact car charger and mains charger. View all of the TomTom ONE IQ Routes accessories here. Do you have a question about the TomTom ONE IQ Routes? Submit your question via our contact page.